Wild West has a very simple 10 payline 5 reel formula that is sure to get your juices flowing when you win some free spins and exciting cash rewards. 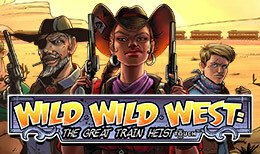 Fulfil your fantasy of completing the great train robbery and join the outlaws in the great American desert to steal the bounty on horseback and earn yourself the reputation of the greatest online slot player that has ever lived. The phrase: “powered by Net Entertainment”, which you find on hundreds of online slot sites across the length and breadth of the internet, carries a certain prominence in our world. For 2 decades they have been pioneers of high-quality gaming entertainment, and it’s always an exciting event when they release a new title to add to their hundreds of engaging others. Wild Wild West: The Great Train Heist, is classic NetEnt from the outset. Its setting is a sparsely populated, isolated stretch of train track surrounded by nothing but endless sand and spiky cacti. However, today is different. Today, 4 bold villains are undertaking a grand plot to commit an audacious – but plausible – heist on the unassuming train staff, stealing a supply of valuables to set them up for life – and make them the stuff of legend! The soundtrack to The Great Train Heist is instantly enticing; a contemporary take on the classic Western style, with tuneful whistling – reminiscent of The Great Escape – and Latino guitar loaded with panache. These are just some of the wonderful SFX that make this captivating audio bonus an already excellently made online slot. The visuals are also of a high quality; more high-end graphic novel than childish cartoon, with personality radiating from each of the 4 main characters, and a great deal of detail in the game’s other symbols; playing-card suits, Wilds in the form of a comic-book “KAPOW”, and un-crackable safes (that probably won’t be so problematic once our 4 characters get their fingerprints on them!). With a coin value ranging from £0.10 to £100.00, this 5 reel, 10 payline online slot comes fully loaded with narrative, character and excitement - not to mention the plentiful rewards! Each character will give you a different bonus, when several of them appear on a payline, while the Wild can pay out 50 times your total stake if you land 5 of them at once. There are a range of bonus features, including a Pick and Click feature – triggered by getting 3 Safe symbols on a combination of reels 1, 3, and 5 - and the prize alone from this mini-game is between 5 and 50 times your stake. The Free Spins feature here is triggered when you get 3 or more Scatter symbols (the Train itself), which will award a minimum of 10 free spins, for 3 trains, while 4 will actually double this amount! Along with a wide range of Wild features, this online slot just keeps providing a stream of visual thrills and exceptional gameplay. There’s so much to enjoy about this online game; the setting, the story, the visuals – not to mention the way it plays and regularly pays out. An instant favourite here at Dream Jackpot, the 10/10 was a given from the moment we started spinning. NetEnt have put some fantastic work into this title, combining elements of classic slot gaming with a truly modern take on the Wild Wild West. The Great Train Robbery, is a Great title, for a truly Great NextEnt Title!